A couple of views of El Cajon from the previous two centuries. The valley at the time was most famous for its raisins, which were being shipped by the railcar load across the country. Hay and grain were also being grown, and cultivation of other fruits and vegetables was taking hold. The Lewis Publishing Company, An Illustrated History of Southern California Embracing the Counties of San Diego, San Bernardino, Los Angeles and Orange, and the Peninsula of Lower California from the Earliest Period of Occupancy to the Present Time together with Glimpses of their Prospects, also Full-Page Portraits of some of their Eminent Men and Biographical Mention of Many of their Pioneers and of Prominent Citizens of to-day, Chicago, 1890. Black, Samuel F., San Diego County, California: A Record of Settlement, Organization, Progress and Achievement, Chicago, S. J. Clarke Publishing Company, 1913. A century ago in this county, in the fall and winter of 1918, the Lake Hodges Dam was nearing completion. The project was undertaken by the San Dieguito Mutual Water Company under the leadership of Ed Fletcher, William Henshaw and the Santa Fe Railroad Company. Its goal was to harness the waters of the San Dieguito River to promote the development of lands owned by the railroad, primarily in Rancho Santa Fe. But ultimately it would serve to promote the development of a good chunk of northern San Diego County as well as the city of San Diego, which would eventually become the owner of the Lake Hodges Reservoir. The photo below was taken in December 1918 at the dam site. It’s from the privately published Memoir of Ed Fletcher. Fletcher is standing on the far right. 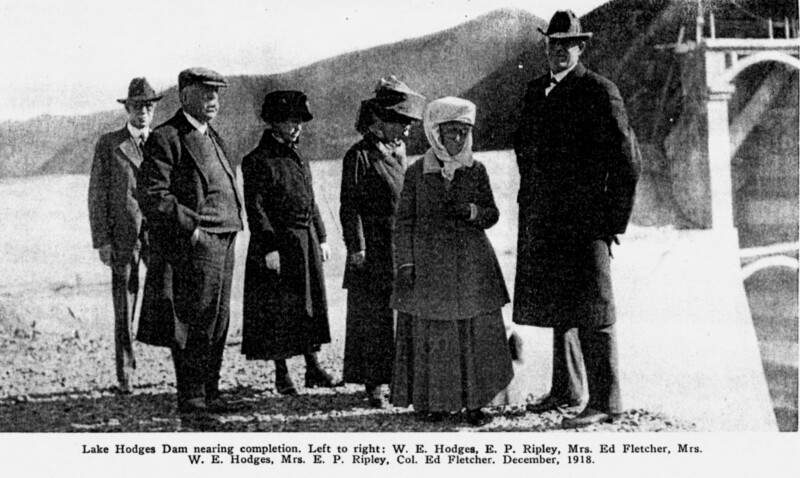 The man farthest left is W. E. Hodges, who was then the vice president of the Santa Fe Railroad and the man for whom the dam and the lake would ultimately be named. Next to Mr. Hodges is E.P. Ripley, president of the railroad. To the immediate right of Ripley is Mrs. Mary Fletcher, wife of Ed. To her right stands Mrs. Caroline Hodges, followed by Mrs. Frances Ripley. Sources for this post, in addition to the abovementioned Fletcher memoir, included historic San Diego city and county newspapers and the city of San Diego’s website.